To no one’s surprise, Verizon has been crowned champion of the US carriers yet again by RootMetrics. 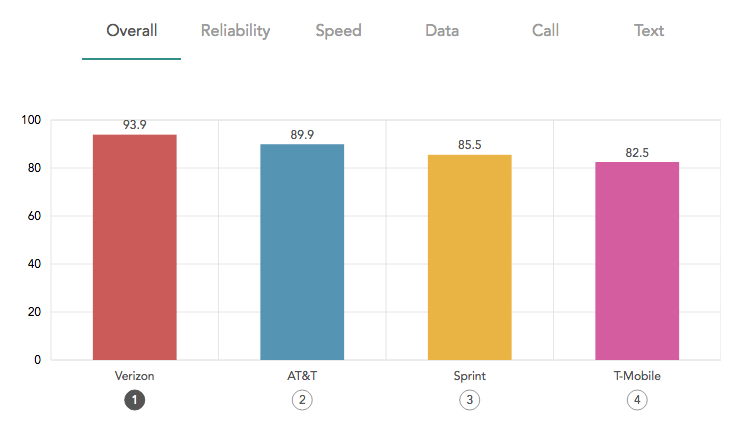 For tests conducted throughout the first half of 2016, Verizon came out on top for all categories, including Reliability, Speed, and Calls. Even though Verizon came out on top again, the tests performed show a bright side for AT&T, T-Mobile, and Sprint. According to RootMetrics, Sprint’s network has seen big improvements with regard to reliability, while T-Mobile continues to excel in metro areas. AT&T sits at a solid second position again, ranking high in all categories, right below Verizon. In some categories, such as reliability, speed and text, AT&T is literally just a couple of points back. As for the individual state level, Verizon killed it. With fifty states and six performance categories per state, there are 300 possible RootScore Awards in the RootMetrics state-level testing. However, many of these tests can come out as draws. AT&T either won or shared 82 State RootScore Awards in this test period, while Verizon gobbled up 274 awards. Trailing greatly is T-Mobile with 20 and Sprint with 11. If you would like a TL;DR version of the latest report, watch the video below.